For those who know me, you might be surprised to find out that there was a time when, yes, I would burn cookies–not on purpose, naturally. It was not an everyday occurrence, but when it happened there could be an episode or two of throwing the odd cookie sheet across the kitchen with the charred remains of cookies gone bad. The other day I read a blogger’s post that thanked her Kitchen Aid mixer, it was great. Today I’m thanking the makers of the Silpat. I’m not sure when I got my first Silpat, but I’ll say that I will NEVER bake without them, ever! These silicone treasures are the saving grace for all of my baking. I started out with just two of them, but when I found they were on sale at Bed, Bath and Beyond (and I had a coupon for 20% off) I had to get more. 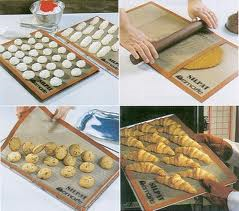 Now, I have six of them and can easily get all my cookies done by stacking up my half-sheet pans with their respective Silpats, rotating them in and out of the oven easily! Regardless of whether it is cookies, or scones, or some other treat, I rarely, if ever burn anything anymore. If you don’t have these things, get some!